GIBSON WINS HOBBY SERVICE AWARD: Roy Gibson received the BPA 2013 Hobby Service Award on July 30 at the BPA's Annual Meeting in Lancaster, PA. In becoming our 14th honoree for his volunteer efforts, Roy was cited for his behind the scenes tech support of our inept CD in the age of computers as evidenced by the new upgraded photo ID badges used at this year's WBC. Roy also provides the printing for the elaborate signage used at WBC and gets his hands dirty loading and unloading the registration room. See more details at http://www.boardgamers.org/wbc13/service.htm. 2014 ELECTION RESULTS: Incumbents Bruce Reiff and Josh Githens won re-election to the Board of Directors and were joined by Bruno Sinigaglio in the class of 2013. Bruno's election marked only the second time that a sitting incumbent had been defeated—proving again that it can be done. While a record number of members voted, it still represented less than a third of the eligible membership at the time. Members are reminded that participation in the annual elections is needed to meet our Non-Profit Corporate requirements regardless of your preferences for the officers. If participation drops beneath the minimum threshold required, we will be unable to continue operations in our current format. The results were announced at the BPA Annual Meeting but the Vote totals and links to officer profiles can be found at http://www.boardgamers.org/board/electionresult.htm. WBC ATTENDANCE GROWS AGAIN: Despite an expected hangover from 2012's less than stellar, AC-failure plagued performance, WBC rebounded to post a 6% attendance gain with 23 events drawing triple digit participation and five with over 200 players each. Overall, the 156 tournaments averaged nearly 57 players per event. This year's champions are listed online. A more complete listing of the top six places, updated laurel totals, photos and an After Action report for every event as only WBC does it will appear in November. Twelve 2012 champions managed to retain their titles another year despite 49 players claiming their first WBC championships. Another 93 recorded their first laurels. Multiple event winners were limited to 15, led by James Pei who won his fifth straight For The People title to maintain WBC's current longest winning streak. The ladies posted their best showing ever with ten titles. Look for the Team Tournament results in the October newsletter. WBC BROADCASTS: Every WBC enjoys media coverage and this year was no exception. Adding to the usual tv coverage was a front page story in the Lancaster Intelligencer Journal by Ryan Mellon which drew more than a few locals to the Host to check us out. Farther afield though was an article by Richard Bliss in Forbes magazine which received considerable nationwide attention. Also present were the Party Game Cast people who made eight mini-podcast episodes (http://www.thepartygamecast.com/#Minisodes) and vowed to return to actually play some games. And of course there are always Geeklists sharing convention experiences from each author's perspective. One such was Norwegian Vidar Aas's report at http://boardgamegeek.com/geeklist/161979/wbc-2013-first-time.... For a list of similar reports see the WBC Publicity page. AUCTION SALES POSTED: The selling prices for this years 529 items in the WBC Auction are available. Average price was $31.94, an increase of 2.5% from 2012. In contrast, the Auction Store sold a record 1560 items from an available inventory of 2038. The average price was down 7% to $12.58. Additional details pertaining to this year's Auction. The Auction and Auction Store continue to grow every year and as a consequence the Auction Staff has made the following changes for 2014. All Auction items will require a minimum bid of $1. All items for both the Auction and Auction Store must be checked in between 6 and 10 PM Monday. The Auction Store will be limited to the first 2200 items due to a lack of space. WBC EVENT REPORTS IN PROGRESS: 30 days after WBC, Event After Action Reports are being collected now and used to update 156 Event pages on our website for a scheduled November unveiling. The GMs who have yet to fulfill that part of their obligation have been notified that the clock is ticking and that prize level and eligibility penalties will apply for those events whose GMs do not comply. WBC is unique among all gaming conventions for providing not only this coverage but also archiving such reports for posterity. Check out the BPA Archives section of our home page to check out the progress of your favorite event over the past 14 years. WBC 2014 EVENT SUBMISSIONS: It's never too early to begin planning for next year—especially if you want to muster support for a new event by getting it on the membership ballot or move an event into the Pre-Con. There is a limited amount of space available for early starts so if you contemplate moving your event to Monday or sooner, you need to start the process now by getting approval early enough for us to seek the required space. 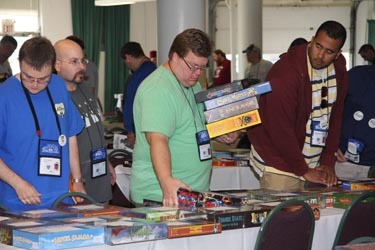 Such moves to or from Pre-Con or Monday status should be discussed asap with conventiondirector@boardgamers.org. Those merely wishing to get an event on the membership ballot who are willing to GM that event should complete the required event form at after reading the GM Guidelines linked from the start of that event form. HANNIBAL IS ON THE MARCH: A new PBeM tournament for Hannibal: Rome vs. Carthage will start on Oct. 15. The format will be Swiss-Elimination with a minimum of 3 rounds to determine the single elimination bracket. All experience levels welcome. 2nd edition online rules will be used and optional adjustments can be used upon mutual agreement. Sign up by Oct. 10 by posting a comment to the PBEM site. NAPOLEONIC WARS: The swiss portion of the tournament has concluded with Rich Shipley being the only player to record three wins—and having one of the only two British wins thus far. It has also been a happy time for the Day family with Warren entering the semis in third place while Rachael and Michael meet to contest 5th and 6th place laurels. Top seed Rich meets 4th seed Rob Mull while second seed Lance Roberts takes on Warren in the semifinals. 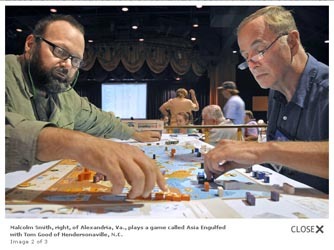 LIKEVICH WINS GREAT CAMPAIGNS OF ACW: It took the better part of three years and two GMs, but after 88 games, the field of 46 was reduced to just Steve Likevich and Scott Spurgeon. They played the three-turn Battle of Chickamauga scenario from Battle Above the Clouds. Steve's yanks split the rebel army in two early on and defeated it in detail. The other laurelists were Mike Pacheco, Jonathon Moodey, Gary Kirk and Ed Beach in that order. The latest laurel totals are listed athttp://boardgamers.org/yearbook13/gcapge.htm#pbem. AIR RAID PEARL HARBOR: THIS IS NO DRILL! No, but it is the start of the 7th biennial BPA Victory in the Pacific PBeM tournament. Four-month rounds with a maximum of six rounds of seeded Single Elimination play. Play starts Sunday, Sept. 15. For more information, see the PBEM site. See all of the details of the previous tournament at http://www.gameaholics.com/vitp_bpa/vitp_bpa_single_elim_11..... Sign up now—although late entrants will be accommodated if possible.